Books: How to Write Your Best Story Ever! So far we have received 13 reviews of How to Write Your Best Story Ever! . I liked this book it was easy to read and understand and is full of tips on writing, it has given me some great ideas for my own stories. My favourite part of the book was the animal and adventure sections. This book is extremely helpful and will definitely amuse those that enjoy writing and story's in general. I like this book because it inspires people to get writing stories and read as well and I hope this review will change your mind in the imangitive world of reading. How to Write the Best Story is an excellent book to lead you to an excellent story with excellent vocabulary or in other words the best story ever! This non fiction book is packed with examples,diagrams, tips and tricks. In the diagram, there are TONS of superb vocabulary like macabre and much, much more. To help, there is a sufficient amount of sentences from lots of popular books including Harry Potter as well as humorous examples. Who could believe a banana robbed a bank? I would recommend this book to be read by 7 to 12 year olds. This excellent book can help you to write many pieces of writing a drama to a love story. This book is an eight out of ten for me because after a while it can get a little repetitive but you still learn new vocabulary. All in all this is a good book! I would recomend this book to you! Gave me many great and fantastic tips! I love writing stories and this book was a useful tool. I would like to investigate similar books for more tips. Although How To Write Your Best Story Ever does sound boring ( although it is) it is actually quiet interesting. My favourite part is when it tells you How to Write Your Best Fantasy Story Ever. My least favourite part is when it goes on and on about making your plot. Please read this book and tell me what you think! This book teaches you about how to imagine a story and how to use the correct grammar. I found it so interesting it inspired me to write my own story. This book gives examples of all sorts of stories so you could write about anything you want. My favourite bit of it is the way the author uses examples of things from stories so you can get inspired by a good novelist. It tells you to go to places you like and get inspiration from there. It gives you many more ideas of where you can go and get inspiration for a story. Overall tis is a good book and I would recommend it. However I only gave it 9/10 because it didn't make me want to stay up all night reading it! Will you be writing a story soon? I hope you enjoyed this review and it helped you decide what to read next. Happy reading. 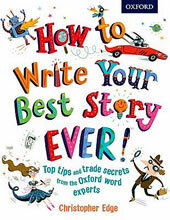 How To Write Your Best Story Ever is quite good and will help me with my writing in school and home although it could be a little more interesting with the red alert, apart from that it is really good and the words in it is really useful in the spider diagram . The inspiration station is my favourite part because I like how it takes bits of text from other books and some are really inspirational . What was your favourite part? In this book I found part two better than part one. I liked it better because it was funny and it said your head teacher wearing fifty pairs of underpants on his head. In part two there is lots of funny words such as: hullabaloo, rumpus, collywobbles and widdershins. Unfortunately, I did not enjoy part 1 because it was a bit boring. I think that if you like writing stories then this would be the perfect book for you. My favourite category was fantasy because the illustrations was incredible and some of the words they wrote about fantasy was great. This book is boring but I thought that part two was better than part one. My favourite part was reading the fantasy stories because there was some interesting words and great illustrations. Would you like this book? Read it to find out.